It hasn’t been a hole-in-one for the University of New Brunswick (UNB) students creating a golf prosthesis to help amputees, but this year they’re looking to sink the putt. 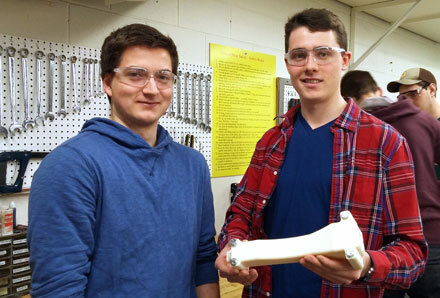 Trevor Scott and Lucas Pupek, mechanical engineering students at UNB Fredericton, are two in a long line of students who have attempted to design and create a device that allows above-elbow amputees to hold onto and swing a golf club. Devices exist for below-elbow amputees, but this prosthetic device is intended for above-elbow amputees. The device is unique in that it must recreate the motions of an elbow joint without actually using a hinge – not an easy feat. This project has been on the go for five years, with previous groups putting their own touches on the design. Scott and Pupek have been tasked with making adjustments to satisfy the client and Dr. Ed Biden, the professor overseeing its progress, said this could be the final iteration of the device. The project is in conjunction with Mr. Radocy, founder of TRS Inc., which specializes in creating recreational prosthetic devices. This partnership is another aspect of the senior project: working with industry partners on a design or product. “The market for the device is niche as it’s limited to adult upper-arm amputees who play golf, but for those people it’s very useful,” said Pupek. This senior project has been a productive learning experience. The groups working on the device have researched, designed and created the prosthetic device, as well as communicating with both Mr. Radocy and the Institute of Biomedical Engineering who will be testing the device. The golf device is one of dozens of projects that will be showcased at the UNB Engineering Design Symposium on March 31 at the Fredericton Convention Centre.